$25.00 discount off your accomodations with us. Minimum 2 night cottage booking is required. Dog sledding is subject to Haliburton Forest availability. Enjoy the thrill of Mountain Lake and some Great Ice Fishing!!! Mountain Lake is known for Whitefish and incredible Lake Trout as the lake is over 100 ft deep in many parts. However, what is not commonly known is that over the past few years, Pickerel have dominated the ice fishing season. Once the Ice is in and the water temperatures even out, these deep water fish come to the shallower depths. We situate our huts on a ridge taht runs from 45-65 feet in depth that is located only 250-300 ft off shore and within easy walking distance for day and night ice fishing. You can walk back and forth to your fish hut making it very convenient to visit with family and friends staying in the cottage. In adition, our huge Christmas and Flodd light lit skating rink is 60 ft from shore and offers a great opportunity to take in a game of hockey in between the best ice fishing times of the day. Get together with your friends in one of our two bedroom lakeside cottages or three bedroom courtyard cottages featuring gas fireplace, BBQs and full kitchens. The linens and towels are even included. This is a step up from the typical ice fishing experience. Check out our winter Trip Advisor reviews. $45.00 per person/per day plus accomodation costs. Scale the slippery slope! Yours Outdoors offers an introduction to ice climbing on a 50ft man-made wall at the Medeba Adventure Learning Centre. Be prepared to burn some calories on this fun and unique outdoor experience. A warm hut and hot beverages will be provided. $65/person plus HST plus accommodation costs at Ogopogo. Rate includes experienced instructors, all climbing and safety equipment , transportation from Ogopogo, and snacks and warm beverage. Come to Ogopogo Resort with your loved one and enjoy the peace and tranquility of the property. Why not take a day out of the weekend to pamper each other with a wonderful relaxing massage? Twin Lakes Nordic Ski Trails offers 5 kms of track set classic and skate sking as well as 2 kms of Snow Shoe Trails. 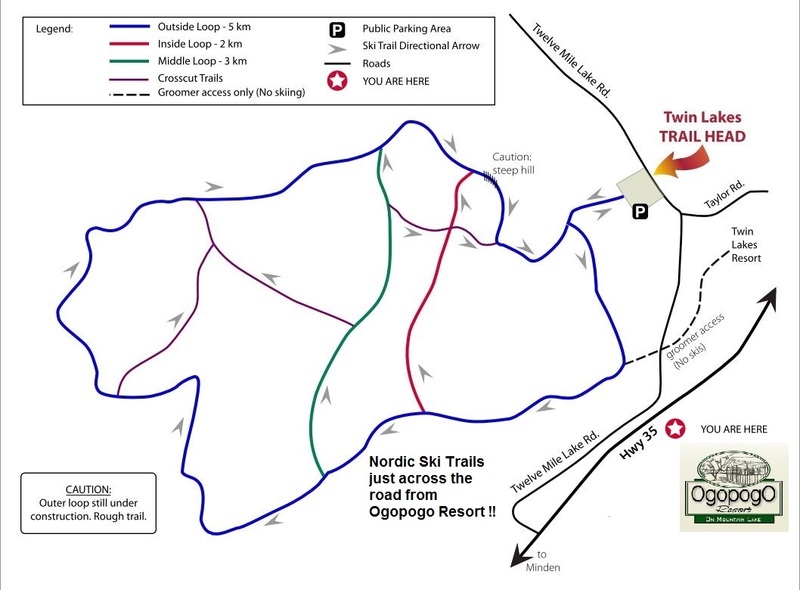 The trails are conveniently located just steps away on the opposite side of Highway #35 ( a 5 minute walk ) We sell ski passes here at the resort and this pass will give you access to many of the other great Nordic ski trails in the area. Package your ski trip with a cozy cottage right here on Mountain Lake where we feature a large ice skating rink on the lake with flood lights for your night skating pleasure and of course a bon fire to help warm up your fingers and toes. Sir Sam`s Ski & Bike Discounts for Guests of Ogopogo Resort!! October/November Low Season Promotion at Ogopogo Resort!! Stay with us Between Thansgiving Monday and December 1st in our Romantic Studio cottage for 2 or our Lakefront One Bedroom Cottages and receive as a $25.00 Subway Gift Card as part of your stay. Our cottages feature fully equipped kitchens but we would like to offer lunch on us and help promote another local Haliburton county business. Want to do something special for someone? Give them a holiday away and they will forever be grateful! Call us to purchase a gift certificate.